When I started riding a road bike about seven and a half years ago, I had no idea there was a right way and a wrong way of climbing hills on a road bike. I just rode up them and put up with the pain in my legs and lungs. In some cases I even avoided the steeper ones by riding a different route. Over the years I’ve learned about the physical side of hill climbing but only recently have a focused more on the mental side of climbing. In doing this I’ve realised that my negative thoughts are the main thing holding me back. So here’s a few things I’ve learned about climbing hills and I’ll start with my own major issue ‘negative self-talk’. Your mental preparation is a key factor in climbing hills. If your self-talk is telling you that you can’t climb hills, or the particular hill you are on, then you are much less likely to achieve it. Believe that you can do it and speak to yourself in a positive way. We’ve all seen those super energetic types who go flat out at the bottom of a hill and then fade part of the way up. Keep your breathing deep and comfortable and gradually increase your effort as you get closer to the top. It can also be useful to break the climb into sections so you just aim to reach the next telegraph pole or other landmark and then focus on the next one and so on. Stay seated for the majority of the climb and shift your weight back in the saddle for maximum leverage on the pedals, and put your hands on the top of the handlebars towards the centre. Stand only when you need a break from your seated position or when the climb gets a bit steeper. Before you stand up, change to one gear harder and change back when you sit again. When you stand up, place your hands on the hoods for maximum stability and try not to rock from side to side too much. Your pedal stroke when you’re seated should feel like you’re scraping mud off your shoe, so as your foot goes down you should push down with your heel and then pull up with your foot as you come up. It’s a waste of energy to tense your upper body by gripping the handlebars tightly (I’m guilty of this!). Your elbows should be slightly flared rather than tight against your torso. As you approach an uphill you want to carry as much momentum from a downhill section. As you begin to climb you want to change gears gradually until you are in the gear you’ll climb most of the hill. For me, this is often my smallest gear possible which is often referred to as ‘granny’ gear. The most energy efficient way to climb a hill is to keep your cadence as high as possible, and therefore use the easiest gear that allows you to maintain your momentum. This is particularly important on a long ride where you should be conserving energy, especially in the early part of the ride. Make sure you breathe right down into your belly, filling your lungs. This will give your fresh oxygen for your working muscles and keep you relaxed. I have developed a bad habit of panicking when I get really short of breath and then my breathing gets more shallow so I have to focus on relaxing my breathing. If you really find a hill is just too much for you then get off and walk. There’s no shame in it. It’s happened to just about everyone, including me. Sometimes it’s just not your day. One of the best ways to learn good technique is to watch the professional riders. You’ll see all this advice demonstrated in slow motion in a major hill stage of the Tour de France. 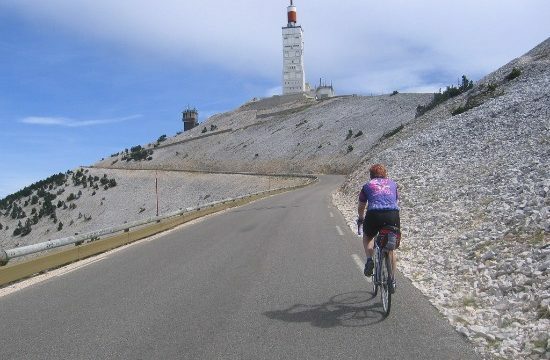 How do you overcome your fear of climbing hills on a road bike? Please share your thoughts via the comments or the Women Who Cycle Facebook page. This is great advice. The one thing i see newbies getting stuck on most often is the gearing. If we dont understand the gears, and we dont practice with different strategies, we get stuck in doing the same thing each time. This results in disappointment and then we just hate hills. 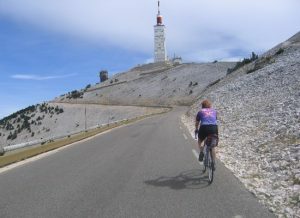 I’m a proud woman who one rode up mt venteaux (as in the picture here) and I’m happy to say it was fun (but I’ll never do it again!!! ).